As well all that you will enjoy our regular parties at the property and our knowledgeable and friendly international staff are always here to help. Also, we provide free maps, free WIFI, free videos and sports that you can watch in our TV lounge, free linen and towels and some vending machine. Incredible prices for incredible services and rooms!!! We hope you will be having a great trip & we are looking forward to seeing you here soon! Check in from 2pm 7.00pm you need to inform us about your estimated time of arrival, we will cancel your booking after 20,00pm if you don't contact us. 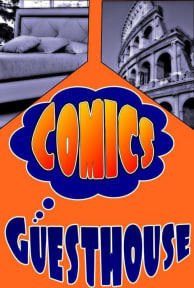 I have really enjoyed my stay at Comics guesthouse. This was a last minute booking because the other place couldn't honor my booking less than 24 hours before i was supposed to check-in. 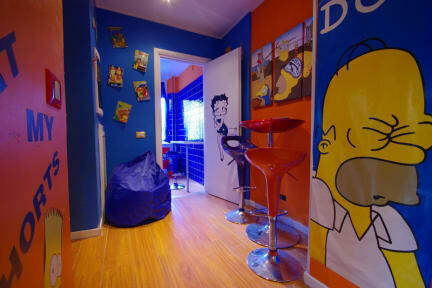 The comics guesthouse is located close to Lepanto metro station and very easy access. I loved the decor and atmosphere of the place. There was a living room where you could play video games, a kitchen and also a washer & dryer if you need to make a load of laundry. The hostel is easy to get to from the metro, and the staff is friendly and efficient. There aren’t many people staying at the hostel at one time, so the place is fairly quiet. My roommates were exceptionally friendly. The beds are comfortable, and the shower and toilets work. WiFi is fast. If you're looking for a great location (just a 2-3 minute walk from the Metro which gets you to Roma Termini) which is in easy reach of things like the Spanish Steps, the Colosseum, etc. this this is your place. It's a small setup - 3 private rooms and it looked like 2 other dorm rooms. We stayed in a private room - it was clean, had it's own bathroom/shower, cupboards, small desk, bedside lamps. The hostel itself is small and cost - no having to put up with loud parties. I'd stay here again. Had an amazing time here, staff were great, comic decoration was cool, had a blast! A weird place honestly. I think it's overall great, but my room was just me and my friend and then like 4 older men every night, so I'm confused at the demographic that it attracts. I like the location and there are free towels and free lockers, so that's a big plus for me. I checked in late and they left a phone number for me to call to get inside the building but since I’m not from here and I didn’t expect to need a phone I didn’t get a SIM card so I didn’t have a phone to call. I had to ask strangers on the street which isn’t the best because I’m a solo 20 year old girl. Inside it wasn’t super clean feeling, and when I went to check out the next day the staff were no where to be found until 30 minutes later.